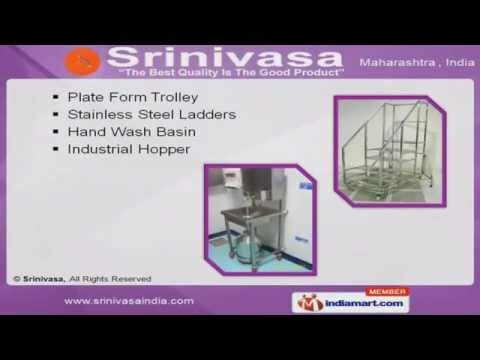 Welcome to Srinivasa Manufacturer & Supplier of Pharmaceuticals, Canteen & Material Handling Equipments The company was incorporated in 2009 at Pune. We cater to Clinics, Hotels, Restaurants & other sectors.Timeliness, excellent packaging & advance manufacturing facility helped us to gain complete client satisfaction.We are engaged in offering wide array of Pharmaceutical, Canteen & Material Handling Equipments.Cupboards, vessels, lockers, linen & material transport trolleys are some of our pharmaceutical equipments & furnitures. Our Plate form trolley, Stainless steel ladders, hand wash basins & industrial hoppers are a class apart.We offer an exclusive range of Canteen equipments & furnitures like Dining table, brain marie, soiled dish trolley & vegetable racks.Along with that we provide Four vessel Trolley, Gas burners & cafeteria tables at industry leading prices.Our Plastic Pallets, industrial conveyors, tanks & heavy duty trolleys are fabricated using premium grade raw materials.